See in Glossary menu. 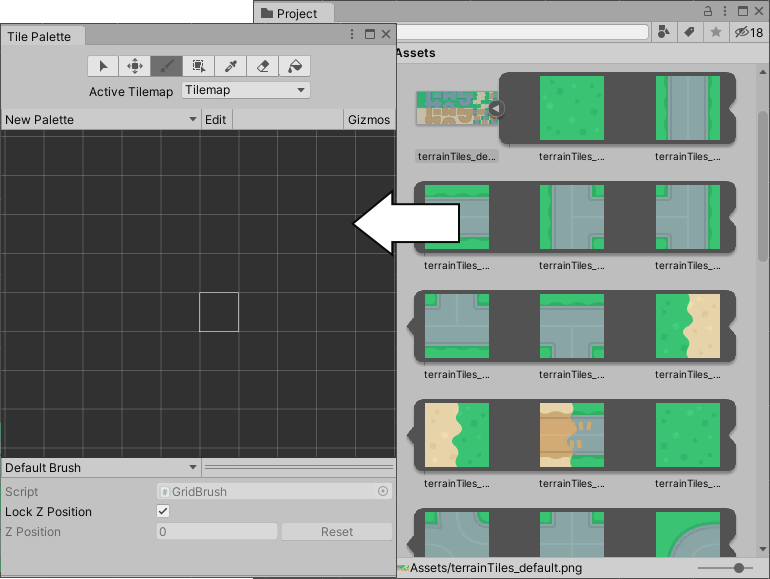 The second method is to automatically generate Tile Assets from a selection of Sprites. Create a Tile directly from the Assets menu (Assets > Create > Tile). You will be prompted to name and save the new Tile Asset to your chosen location. Refer to the documentation on Tile Assets for more information. Tiles can be automatically generated when selecting Sprites for a Palette in the Tile Palette window. To create a new Tile Palette, select Create New Palette on the Tile Palette window, and select Create. Refer to the documentation on Tile Palettes for more information about the different options available when creating or editing Palettes. See in Glossary from the Assets folder onto the Tile Palette. You will be prompted for the save location for the new Tile Assets. Select the save location, and the new Tile Assets are generated in the selected folder, and the Tiles are placed in the Palette.